EVENTures is an event management firm covering International & Local Keynote Speakers, Corporate Games, Events, and MICE (Meetings-Incentives-Conference-Exhibition). Robert Chaen is a prolific Corporate-Game Designer with countless games up his sleeve. 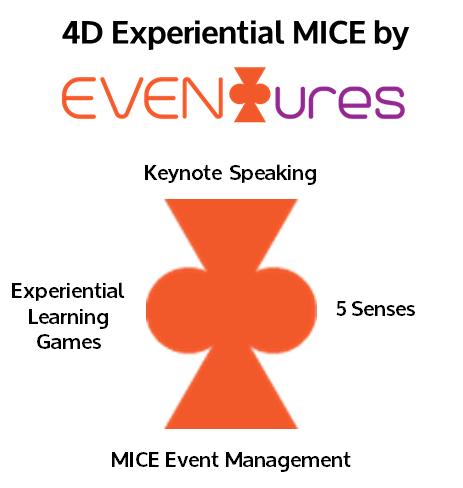 Eventures has designed a new product category called "Immersive Conference Experiential Learning" where the keynote speaking, games, and event management are all integrated as a totally immersive experiential learning event. Traditionally all 3 functions are separate and often unrelated. Whatever are the Principles & Competencies identified (e.g. management, leadership, team building) and Messages from the Client will be brought ALIVE by the games. Every game must meet all the objectives set with the Client and Coaches. The simple Eventures logo consists of 2 perfect triangles and 2 perfect circles only. The 2 Triangles represents the seamless blending of conference keynote speaking and event management. The 2 Circles represents the seamless blending of experiential learning games and the activating the 5 senses i.e. pictures, sounds, feelings, tastes, and smells. All in all, the ultimate result is called "Experiential MICE".